The most popular fertility icons are all reminiscent of the female shape, honoring the power of women in the reproductive cycle. However, women power only one half of that cycle. Turns out there’s an appropriately shaped fertility icon for men, too: Carrots. A study released this past fall by Harvard University School of Public Health shows that carrots are good for a lot more than improving your eye sight. 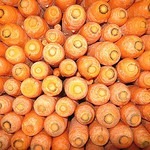 For some men, carrots may be able to improve the quantity and quality of sperm by up to eight percent. That’s a great reason to eat your veggies! Carrots weren’t isolated in the study. Eating other yellow and orange colored vegetables and fruits may have the same affect. Examples include sweet potato, melon, pumpkin, pepper and apricot. However, eating carrots was found to have the greatest impact. The study, which appears in the journal Fertility and Sterility, involved 200 men of college age. Changes were made to their diet to find out what effect it might have on their sperm count and quality. Those who ate more carrots were found to have the biggest gains. In particular, the study found that carotenoid could improve the movement of sperm, whil lycopene could improve the shape of sperm. Carrots are packed with carotenoids, which gives them their orange color. The body also converts carotenoids into Vitamin A, which was also found to improve the health of sperm. Vitamin A is also a powerful antioxidant, which fights free radicals in the body, supporting the overall reproductive system. Carrots may have emerged as the superstars in the study, but they weren’t the only sperm-friendly foods discovered. Tomatoes were found to be especially beneficial because of their lycopene content, which helped to ensure a healthy shape, or morphology, for sperm. Normal sperm should have a smooth, oval-shaped head and a long, thin tail. Any abnormalities in that shape may impair the sperm’s ability to reach the egg or to attach to it. The study found that eating tomatoes could improve the number of healthy shaped sperm by eight percent to 10 percent. Carrots were highlighted because of their carotenoid content and their influence on Vitamin A production, but these nutrients are also found in other foods. Men who aren’t big fans of carrots may be happy to learn that they can get their carotenoids from spinach and lettuce, which contain lutein. They can also get plenty of Vitamin A from sources like oatmeal, sweet potatoes and broccoli. Infertility is a growing problem, and many doctors and health specialists believe that diet and environmental factors play a role. The Centers for Disease Control and Prevention says that eight percent of men age 45 and under who are sexually experienced have been to see a fertility doctor. Other studies have shown that average sperm counts are steadily decreasing, as well. The Harvard study reveals important information about how men can treat their fertility issues by using a comprehensive approach that addresses lifestyle issues. By eating a diet that is high in healthy fruits and vegetables and low in high-fat diets (which have been shown to lower sperm counts), men may be able to improve the quality and quantity of their sperm and to conceive naturally.